5 Reasons Photo Books Make The Perfect Gift! Raise your hand if all your kid’s baby pictures are in digital format. Yup, majority of us. And my mom is constantly asking me to mail her some prints. A company with a mission to move stories off your device and into your life. I have been on a quest to preserve memories and to put pen to paper more often so their mission totally struck a chord with me. This Christmas I’m sending my Mom & Dad and the in-laws photo books filled to the brim with memories of this year passed. Although they live far away, I want them to feel like they were there. EASY. Once you choose the type of book you want to create, the Artifact Uprising editing platform makes it a breeze to add photos, change the order, add text, and so much more. & You can download their App from the Apple App store and make it all from your iphone! It took less than a half hour to complete this book and I didn’t even get frustrated ONCE. That says something! CHEAP. For under $20 you can create a heartfelt gift for your loved ones. FAST SHIPPING. & they’ll ship it right to the recipient. How easy is that? When you have family all over the country, it’s awesome to be able to buy online and have it shipped directly. It usually ends up being cheaper than if I bought something locally and mailed it myself. GOOD QUALITY. The card stock Artifact Uprising uses is of impressive quality, even for their cheapest option! Artifact Uprising is even letting my lovely readers get in on some photo book-making-fun just in time for the holidays! Enter below for your chance to score $50 USD to spend on whatever you please! This contest is only open to US & Canadian readers. Now go enter, why don’t cha! PS: I’ll be sharing this post these blogs. Just like majority of infants, our little guy looooved to be swaddled up in a cozy swaddling blanket. But he always managed to get his arms out of the dang blankey. I mean, we would wrap him up so tight and he’d manage to get out of his little baby straight jacket every single time. We tried the swaddles that keep babies hands pinned to their sides but he screamed bloody murder. He wanted to move his hands and I get that! I like having the freedom to move around at night, too. Enter the Love To Swaddle UP. It’s genius design keeps baby covered, just like other swaddles, but allows baby to have the freedom to move their arms wherever they please and self soothe. The shape of the body also allows baby the freedom to spread their legs a bit, a natural sleeping position for a little baby. I haven’t had the pleasure of giving the Love To Swaddle UP a test drive because my little one ain’t so little anymore BUT from my experience with other swaddles, this is EXACTLY what my son was begging us for. He didn’t want to be pinned down like a little burrito. He wanted the freedom but we wanted him to be wrapped up and cozy. Let’s just say we can’t wait to use the Love To Swaddle UP on our next little bundle of joy. Nope, that’s not a pregnancy announcement 😛 !! The fabric is so nice and cozy and the detail of the grey and white trim is perfect for a little baby boy or girl. Check out this feature. There is space for the car seat buckle so baby can wear this during long road trips or even on those night time drives when you’re trying to get babe to fall to sleep and then easily slip them into the crib without waking them up. This would have saved us a time or two! Especially the time we drove halfway across the country with a 4 week old! I love that there is a two way zipper so you can easily zip up from the bottom for a quick diaper change instead of taking the zipper down from the top and risking baby loosing all that magical sleepy dust! Drum roll! Now it’s time for you to try to score your very own. Enter using the Rafflecopter widget below! You can even come back each day to give yourself more chances! This contest is open to Canadian entrants ONLY. Best of luck, pals!! My blogger pal Iulia from The Best of Baby is giving away this GORGEOUS ring sling that’s meant for the water. How awesome is that colour!? We are just getting into ring slings over at my home and I’m really enjoying the simplicity of throwing baby on my hip and having the pressure taken off my body so I can stand up straight! Ring slings are really wonderful and great for quick up and downs. Without further ado, here’s Iulia’s review! Summer time is pool time! But going to the pool with kids is vastly different than it was before having kids. The whole “lounging” term doesn’t really apply. Wrangling? Yes. But lounging not so much. 1) Babies love it. The chubby little monkeys love the darn things. They’re close to mama, but they still get to splash to their hearts content. 4) Makeshift sun protection. You can use the tail as a wrap to keep the sun off of the baby’s or your shoulders. Enter these beautiful slings by Cute Awaking. Tasha is a mother of 4. She’s a crafter at heart, so in 2012 she put her creative talents in action and opened Cute Awaking. At first, it started out as mostly crochet projects, but when her youngest was born in 2014, she was introduced to babywearing and fell in love! She started making her own wraps and slings, and when she realized that people really loved her work, she became completely CPSIA compliant. She follows all current safety standards and is a member of BCIA. Her work is beautiful, well made, and affordable! And she’s generously offering one Best of Baby (and other participating blogs) reader the chance to win a Cute Awaking. water ring sling of their choice. Ok, realistically, we can’t protect our children from all of these awful chemicals, but we can be intentional about certain items, especially items meant to go in their mouths like teethers. If it’s supposed to go in a baby’s mouth, it darn better be non-toxic and natural. And is there anything more natural than wood? I mean, there’s not even any explaining I need to do…it’s just…wood. After an extensive search, I found two Etsy shops that had top of the line wooden teethers…unfinished to boot — nothing but pure wood! The second teether is a Mama Rocks necklace by In Between The Raindrop. It doubles as both a teething and nursing necklace (read more here if you want to know why I love nursing necklaces). It’s made from a cotton cord and geometric unfinished maple wood beads. The teether stays on mama and gives your baby something to chew on and fiddle with as he or she keeps close to you. It’s jewelry that you can wear and that your baby can yank/chew/slobber on to her heart’s content. For the first few months of my baby’s life, he didn’t really do much but flail his arms spasticly but around 3 months he discovered my necklace started grabbing for it. I’ve always worn this really thin silver chain with a pendant that means a great deal to me. One day he nearly strangled me and almost broke my beloved necklace. Sound familiar? Yea it’s a baby thing…but it doesn’t have to be like this! Have you ever seen necklaces like these? They are MAGIC when it comes to grabbing a baby’s attention. Wearing this while nursing will draw your little one’s focus back to where it needs to be – your chest. And they offer tactile engagement so it gives them something to pull on other than your hair or your bra strap. And to top it all off, it’s super cute! You can wear it as you would any other necklace, except this is one you actually WANT your baby to fiddle with. It comes in really handy when it’s milk time or just to keep an antsy baby occupied while being held. 1) They’re BEAUTIFUL – They come in so many cute colors and styles. Their Sugargems line is particularly striking. But not only are they knowledgeable, they’re also generous 🙂 My Natural Baby is offering one lucky reader their choice of a Sugargems teething/nursing necklace. Have a silly, distracted baby? Or maybe you just want a cute new necklace? Enter below! But if you’d rather not take your chances on winning, Kelly is offering free shipping for any orders over $30 Australian…but that’s actually only $24 US…a steal! Use code BESTOFBABY at checkout. Today, I’m teaming up with my pal Iulia from Best of Baby and a few other bloggers to bring you the coolest Mother’s Day Giveaway! Prepare to drool! Mother’s Day is around the corner, and while you can find plenty of “mommy” themed necklaces out there, Iulia from Best of Baby wanted to do something a little bit out of the ordinary…so she found this beauty. At first glance, it looks like a delicate pendant necklace with a pretty design on it. But you know what the pattern actually is? An Oxytocin molecule. Say what? No, this is not a science post, so if you’re not a fan of the subject, no worries! But even if you’re not that into science, if you’re a mother, you should definitely be a fan of this necklace! (Well really, if you’re a human in general, but especially if you’re a mother). So how’s that for a uniquely awesome “Mommy” necklace? Want one? Well Heather from HWorks is generously offering one lucky reader a chance to WIN an Oxytocin necklace. But if you just HAVE to have one and don’t want to risk not winning, she’s also offering a 25% discount using the code BESTOFBABY for everything except the “squash blossom” necklace through the duration of the giveaway (ends April 30th). This giveaway is open to both Canada and US residents. It’s really no surprise your body is different after having a baby. You just spent 9+ months creating a HUMAN. Lets give ourselves a break, shall we? I’m 10 months postpartum and I’m feeling more and more like my pre baby self each and every day. So here I am preparing to go back to work and I’m scrounging around in my closet to find something that fits my new [fabulously curvy] body! My body is just different now and it wouldn’t do it justice to try and make my old wardrobe work. Plus I’d look like I was stuffed into a sausage casing! I was cruising the mall after christmas searching for good sales on blouses and work dresses and I stumbled into the H&M maternity section and was AMAZED. Not only was I able to find flowy and comfortable tops and dresses, they were easy on the wallet. I found two wrap dresses that are perfect for nursing or pumping at work. With my first pregnancy I found it hard to justify maternity clothing because I thought I’d be done with them right away after the baby popped out but the truth is, I wasn’t fitting my pre-pregnancy jeans after the baby, and nor would I have wanted to! A zipper and button on your jeans digging into your shrinking uterus doesn’t sound like a fun time to me. You will want flowy, loose, and comfy during and after your pregnancy, I guarantee it. Maternity clothes last a lot longer than you’d expect so one should never feel guilty getting a few staple pieces to get you through. At first I was embarrassed that I was going to buy maternity clothing after having a baby but you know what? Maternity clothes fit the female body so perfectly, bump or not. Now it’s time for you to win a shopping spree at H&M! How would you like a brand new wardrobe just in time for spring? Enter below to win $250 to spend how ever you’d like! Good luck!! 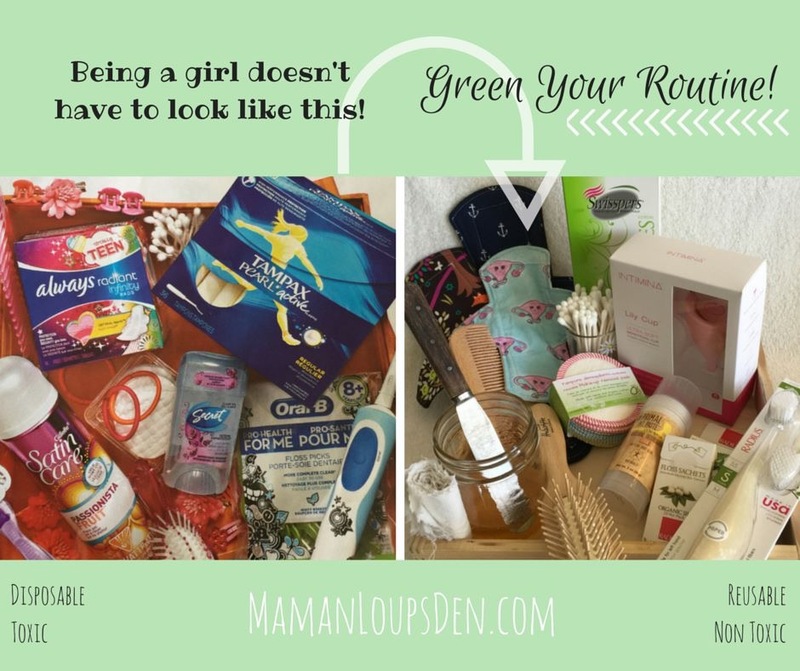 Welcome to Maman Loup’s #GreenYourRoutine Giveaway! Lindsay at Maman Loup’s Den wants to help girls and women “green” their routines. Inspired by a magazine ad encouraging Moms to present their daughters with various disposable beauty products, Maman Loup found alternatives that contain safer ingredients and, in many cases, are totally reusable. To find out more about how to green your routine, check out her full post! – One (1) wooden comb from Life Without Plastic (affiliate link) ($24). Participating bloggers were not compensated for promoting this giveaway. For any questions, please contact Lindsay at mamanloupsden(at)gmail(dot)com. A baby in a bonnet — is there anything sweeter? Umm, I don’t think so. I don’t have a little girl to put a bonnet on but fortunately Iulia from Best Of Baby does and she has reviewed these adorable bonnets by Nora Bees Bonnets Etsy shop and is letting my readers get in on the giveaway. How sweet is that!? Go read her full review here. *Sigh* can you imagine a world where all baby girls wore bonnets like this? #BringBackBonnets!